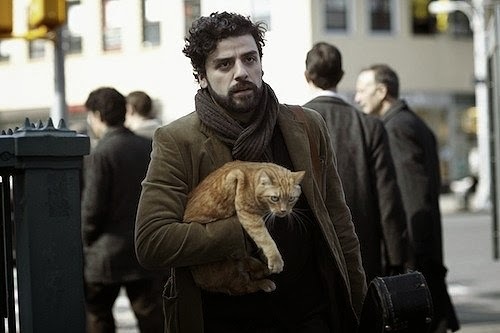 Traversing the basket houses and back alleys of the early 1960s, pre-Dylan Greenwich Village music scene, Inside Llewyn Davis is the Coen Brothers’ ode to the fuzzy line separating artistic purity from creative recalcitrance. Driven by a melodious period soundtrack, the film is part O Brother, Where Art Thou? and part Barton Fink, but with a brooding mood and protagonist that envelopes its occasional humorous flourishes. For the uninitiated, part of the film’s fun is connecting its fictionalized characters to such real-life inspirations as Tom Paxton, Doc Pomus, Ramblin’ Jack Elliott, and Peter, Paul and Mary. The titular folksinger is directly drawn from Village legend Dave Van Ronk, who once releasing an album titled Inside Dave Van Ronk and, like Llewyn, stubbornly stuck to folk forms in lieu of more mainstream or “marketable” deviations. “I thought you said you were a musician,” growls cantankerous jazz player Roland Turner (John Goodman) after Llewyn informs him he plays folk songs. Llewyn’s also a hard person to like, as the perpetual dark cloud hanging over his head is often self-made, whether he’s sleeping with his friend’s wife (Carey Mulligan) or distaining a share of performance royalties to a novelty song written by that same friend (Justin Timberlake) that eventually becomes a hit, because Llewyn deems the diddy as beneath him. Indeed, while Inside Llewyn Davis looks and sounds gorgeous, its message remains as enigmatic as its surly, depressed protagonist. A quick glimpse of a young up-and-coming legend taking the Gaslight Cafe stage near film’s end posits that perhaps Llewyn’s troubles are a consequence of the man, not his music.